A Return Material Authorization (RMA) or Sales Return is the process of a seller accepting a purchased item back from the consumer. In turn, the customer receives credit, cash refund or a replacement. Some of the common reasons for return include receiving damaged/expired product, wrong delivery, fraudulent order etc. 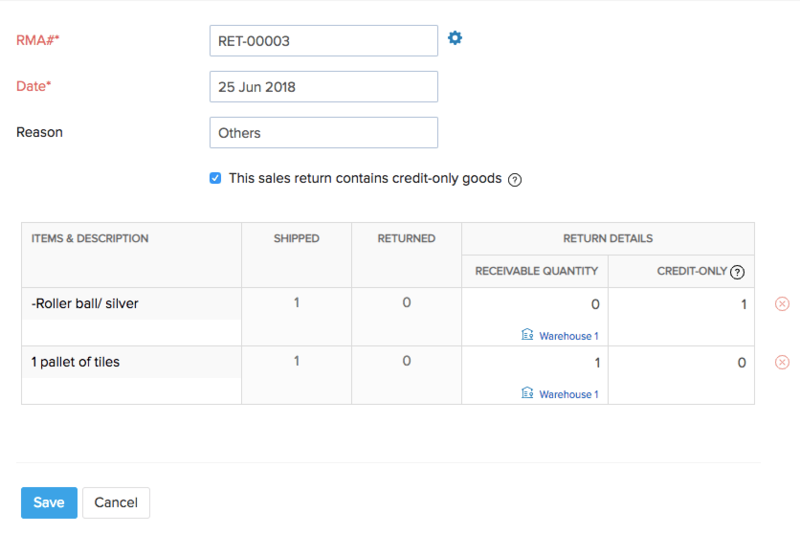 The various stages of processing a sales return in Zoho Inventory. Before you begin with sales return, your inventory items must be eligible for return. A sales return can only be initiated for items that you qualify as returnable. Insight: Service items and items with only purchase information cannot be returned. Navigate to the Items tab in the sidebar. Click the +New button to create a new item. Toggle the Returnable Item switch. Switch turns blue to indicate ON. Insight: If the switch is not turned on, the item will be considered non-returnable and you won’t be able to raise a sales return for it. Click Save to create a new returnable item. Open the items list view. Mark the checkbox beside the item name to select the item. 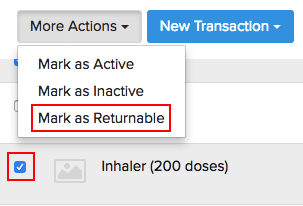 Click on More Actions and select Mark as Returnable. The selected items will be marked as returnable. Insight: You cannot create sales returns for orders that are drop shipped or manually fulfilled. Click on the sales order tab from the side bar. Open the respective sales order. Choose Sales Return from the dropdown. Enter the sales return details. Configure the quantity of the returned items. If you want to record damaged/expired stock in the sales return, enable the ‘This sales return contains credit-only goods’ option. The Return Details will be split into two sections: Return Quantity and Credit-Only. Enter the receivable count in Return Quantity field and the damaged count in the Credit-Only field for the respective items. Insight: The quantity specified in the Credit-Only field will not be taken into stock. Click Save to create a sales return. Go to the sales return. Configure the items and the quantity that you want to receive. Click Save to record a receive. From the sales return, again click Receive to receive the rest of the returned items. Insight: If you have specified credit-only goods in the sales return, you will not be able to receive it as it will not be taken into stock. To provide a refund or credit for the returned items, you have to create a credit note. Creating a credit note will also increase the accounting stock of the underlying items. 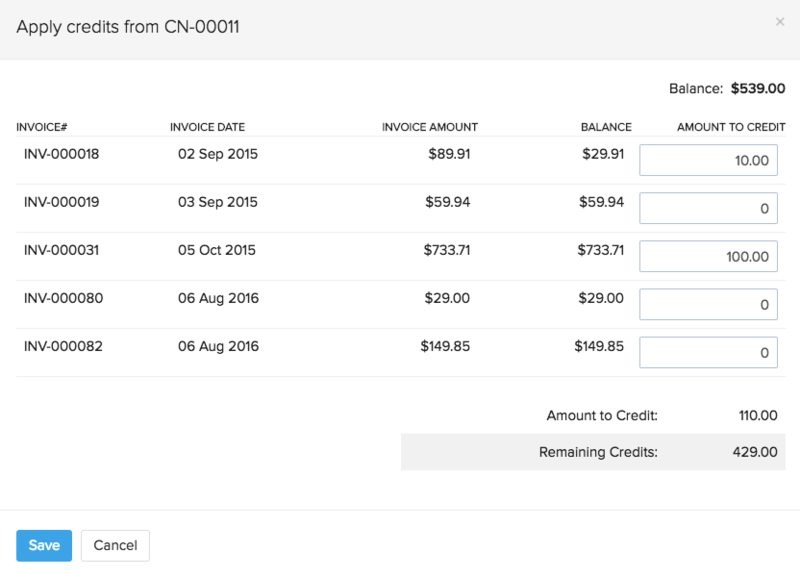 Configure the items for which you want to create a credit note. Insight: Learn how you can handle the return of batch tracked or serial number tracked items here. If the customer is a regular buyer, then instead of giving cash refunds you can provide credits. These credits can be applied to their pending or future invoices. On the same credit note page, click the Apply to Invoice button. Distribute the credit balance against each invoice. Click Save to apply the credits. The credit will be deducted from the total invoice amount. Insight: A credit note created for a customer can only be applied to the invoices created for the same customer. To learn how you can handle more of such cases of sales return in Zoho Inventory, visit our FAQ section.